Listening to Thursday’s keynote speaker and leading researcher on sustained silent reading, Stephen Krashen. He highlighted a 2013 study from the UK which showed that reading books often at the age of 10 and reading books more than once a week at the age of 16 has a greater impact on student reading ability than any other factor, including socioeconomic status, being read to as a child, visiting the library, or the education of the parent. This study, along with much of Krashen’s other research, supports my current school’s focus on SSR and continued commitment to giving students time to read choice novels during the school day! Learning about new types of technology, such as Voki, where students can select an avatar of their choice to read a piece of text, or record their own voice reading the information. By using the program, students are given a way to publish their work and develop a larger audience than just the teacher. Attending the session titled “Repackaging Research for the Hyper-connected Millennial.” In the session, the Paige Jaeger explored ways to increase the rigor and relevance of research projects by focusing on essential questions that encourage inquiry, vocabulary of the discipline, and a knowledge product. She gave numerous examples on how to transform a research packet into a purposeful assignment that encourages students to wonder, investigate, find meaning, discover, synthesize, and draw conclusions from what they learn. Overall, the conference was a worthwhile experience. I am excited to use my newfound knowledge however I can throughout the school year! 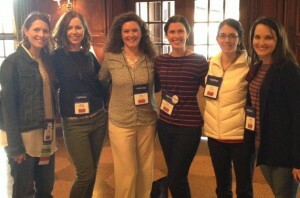 Last week, I had the wonderful opportunity to attend the Virginia Association of School Librarians annual conference. It was a great learning opportunity for me as a student in the School Librarianship program. Some of the things that I learned about were elementary library centers, creating a library that supports teachers, and how to better promote my library program. Hearing the keynote speakers was inspirational and really supported many of the things that I already knew about reading. The one point that Dr. Steven Krashen made that will stick with me for many years was the best way to close the achievement gap is to provide greater access to books. 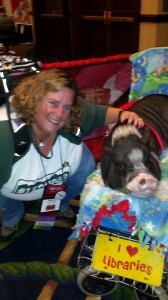 The best part of the conference was the networking opportunities. I got to meet and make connections with librarians from across the state. The Hotel Roanoke and Conference Center in Roanoke, Virginia was a great location for the annual Virginia Association of School Librarians conference. The hotel provided the space necessary for all the wonderful sessions and participants. There were so many presentations offered that I could not attend them all. The highlights of my trip included the Keynote speakers, Stephen Krashen and Paige Jaeger, both of whom I enjoyed so much that I attended their concurrent sessions. I was pleased to listen to Neal Shusterman discuss his novels, writing and favorite authors. Paul Barron taught valuable Google search methods, and librarians and teachers shared classroom ideas – many of which I will be able to incorporate into my own curriculum. The first timers breakfast was a treat, as were all the door prizes. 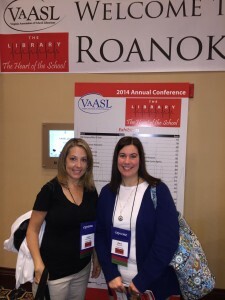 The VAASL Annual Conference is definitely not to be missed!